Amino Lysine capsules 100 pcs. Brussels sprouts-germ capsules 60 pcs. Amino Glutamine capsules 250 pcs. 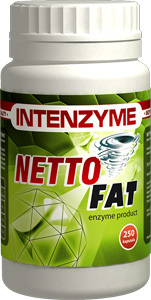 NettoFat capsules provide a continuous fat-burning, due to their enzyme content, and inhibiting further fat-deposits, accelerating metabolism. Enzyme is responsible for the right metabolism taking place in the body. Fats taken in by nutrition and getting into the intestines are decomposed into fatty acids and glycerine by enzymes. The released fatty acids are provided as energy sources for the skeletal and cardiac muscles. Cellulase is an overall term in fact; all the enzymes can be classified like it partaking in a way or another in decomposition of cellulose. Their task is to decompose cellulose into simple glucoses that are not stored in the body, but get utilized immediately throughout the metabolism. The enzyme called Invertase decomposes saccharose (granulated sugar) – in the organs of the human digestive system – into its components: glucose (grape-sugar or dextrose) and fructose. The enzyme provides strong invertment of the sugar in different rates, inhibiting formation of unwanted sugar crystals this way. Active ingredient of Coleus forskohlii, forskolin plays an important role in cellular functions, including hystamine-production inhibiting relaxation of the muscles, enhancing thyroid functions and accelerating fat-burning. Black pepper (Piper nigrum) is a bush aboriginal in tropical regions, its grains are used freshly crushed or ground. Its multiple curative power is well-known in the Far East: it enhances fat metabolism, diuretic, carminative, invigourating. Plus it is an excellent spice. Long pepper (Piper longum). Te initiative step toward a complex detoxifying therapy of ancient ayurveda – especially in case of overfed patients – after a few days' fasting or low-calorie-diet, then enlivening the fire of digestion. This plant greatly contributes to the discharge of toxins from the cells and into the digestive tract. Corn-silk is a component of peasant medicine, used continually. It has been administered in bigger quantities to discharge kidney-stones and bladder-stones. Due to its diuretic effects it is also one of the components of several herbal mixtures to treat diabetes or obesity.